I am a morning person. I like waking up early and getting a lot of things accomplished before I head out the door for work. There’s nothing like a hot cup of tea or coffee and a tasty breakfast plate that gets me excited to start my day. I had a great start to my day today. I’m in an extra good mood because it’s Friday and because I made these delicious pancakes to start my morning. I was inspired to make this pancake after seeing recipes from other blogs, especially Heab’s blog, Heather has a lot of great pancake recipes. 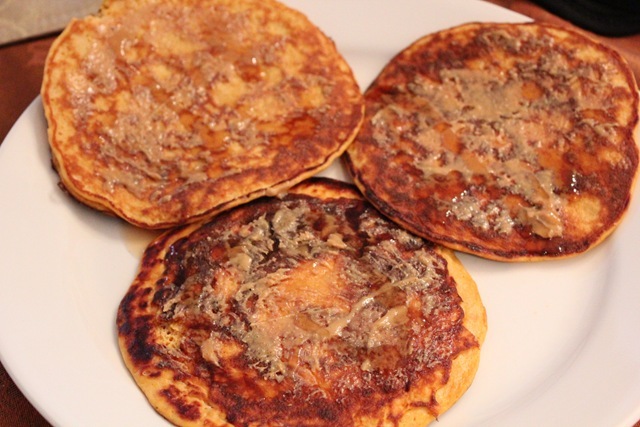 These protein packed pancakes are my healthier alternative to traditional pancakes. I love that it is flourless, and has a good balance between carbs and protein. I find that if I start my day with a mix of carbs and protein, then it helps keep me satisfied and full until lunch time. 1.) Cut sweet potato in half and remove the skin. In a bowl, mash the potato well with a fork or potato masher. 2.) Add the rest of the ingredients and whisk it all together to make the batter. 3.) Cook on medium low heat. I like to smear peanut butter on top of my pancakes while it’s warm and then add a little maple syrup. 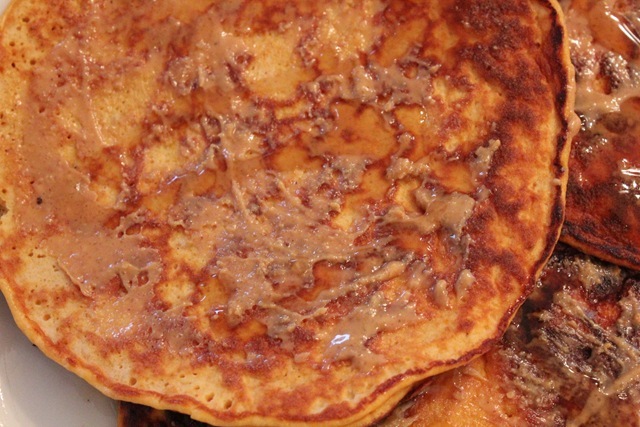 Also great on these pancakes are coconut butter and sprinkled with toasted coconuts. These pancakes are filling and another great breakfast dish that can be eaten on the go. One day I was running really late in the morning. I rolled the pancakes up, put it in a ziplock and ate it at work. 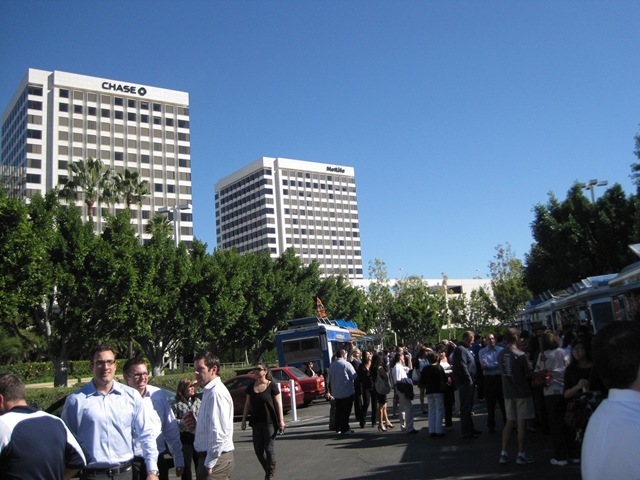 Yesterday, the hotel next to my work hosted a Food Truck Day. It was a hot day and it was a great day to have lunch outside have some fun under the sun. 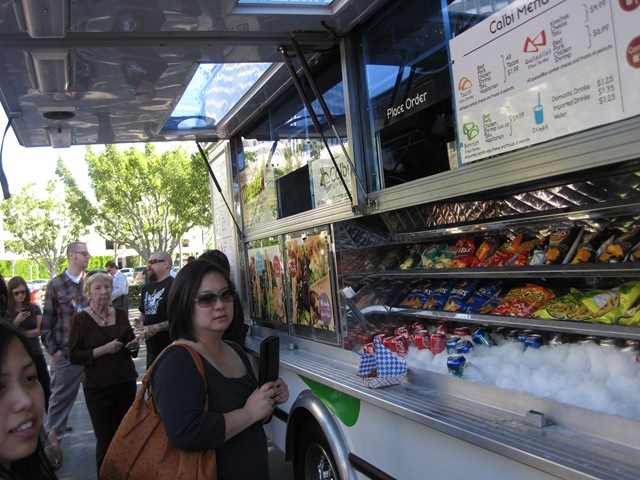 The most popular food were the Korean BBQ dishes from Calbi truck. The line was long and I’ve had it before so I skipped it this time. 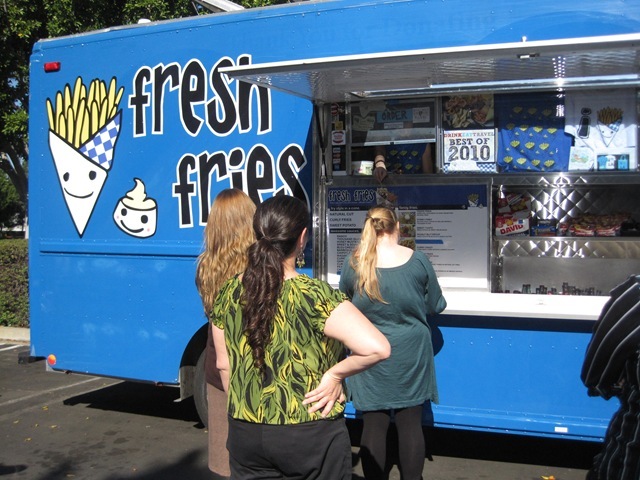 The fresh fries truck caught my attention with their sweet potato fries, served with hummus, smoked paprika and sesame seeds. I split one serving of fries and I shared with friends. The fries were perfectly done with the right crisp and the hummus topping was delicious. It was quiet addicting. 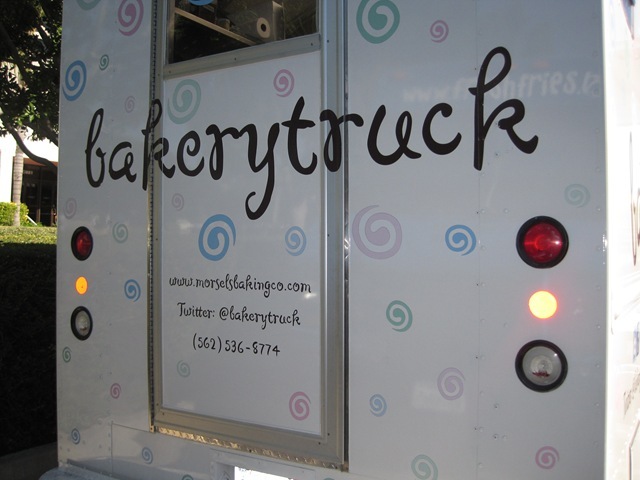 Next, we had a tasting of the delicious desserts from Bakery Truck. For more pictures from the event, you can check it out here. HEAB has the BEST pancake recipes. Love that lady 😉 These sweet potato pancakes look like the jam. I also am an early riser. I feel much more productive when I get stuff done in the beginning of the day. I’ve always wanted to eat off a food truck. 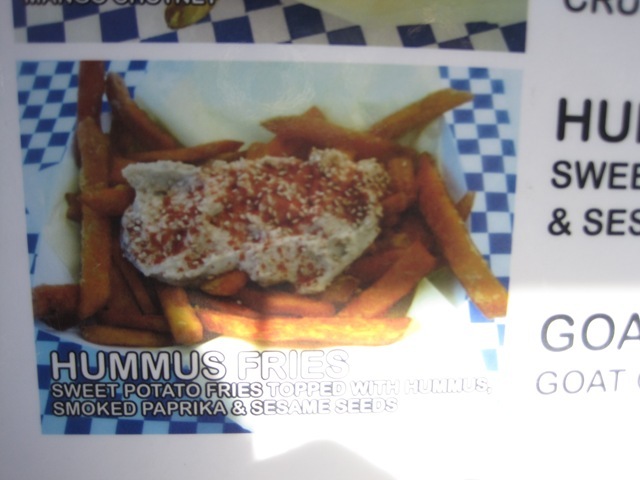 The sweet potato fries look SO good- and served with hummus? How awesome. 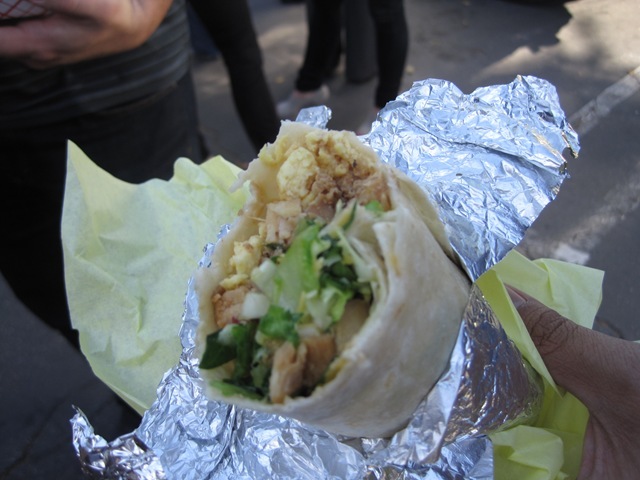 Oh wow that is a sweet idea I did see a really cool truck outside our office in Down Town LA but nothing I can grub on. I miss the comfort foods and I have to have self control but those Sweet Potato fries are so divine, I can have those with hummus even better. Yummy I’m craving some now eeps. I’m so glad that my 30 days raw challenge is at an end this Sat. So I’m going to dive into some Sweet Potato Fries and have Indian Food with my Daughter on Sunday. 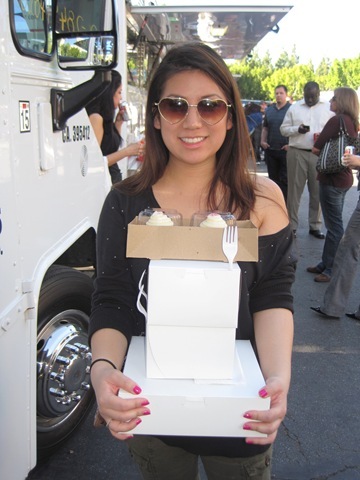 Great pics and those cupcakes are delicious. There is a cupcake shop in DT LA that has all Gluten Free and even have vegan cupcakes I need to have some and they are delicious and moist who would have thought. I would DIE for those sweet potato fries! Must create at home, I never thought to put hummus on sweet potato fries! genius!!! U look beautiful and so does your friend! 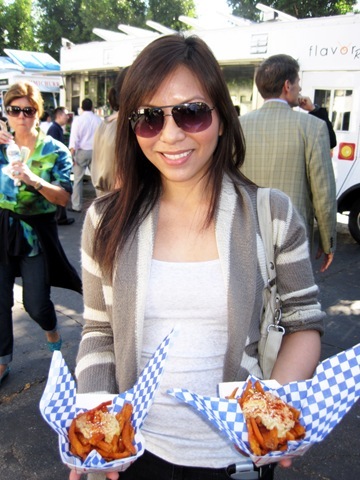 Two beauties with yummy food ! MM girl! I made the same pancakes and they are so good. I’m currently obsessed with sweet potatoes. I actually haven’t made pancakes with them in a while though. To do ha. oh yum! all of that food looks awesome! 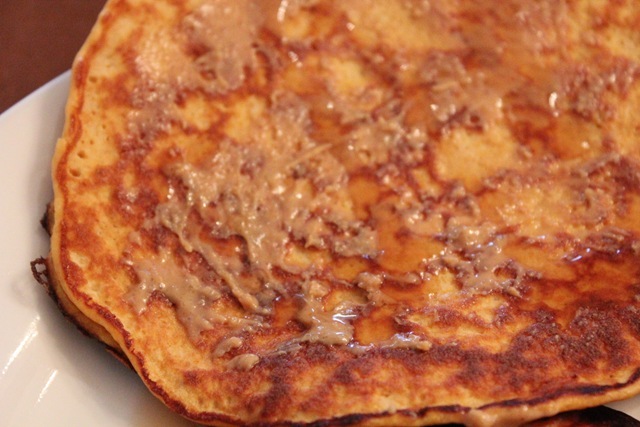 what a great idea to make pancakes with sweet potatoes instead of flour! By the way, when’s our meet-up? Theirs no formal blogger meet-up, but we can surely make our own! Those sweet potato pancakes look perfect, and I love that they contain zero flour. Definitely my kind of flapjacks, especially if covered in coconut butter! Nothing like a good sweet potato coconut butter combo. 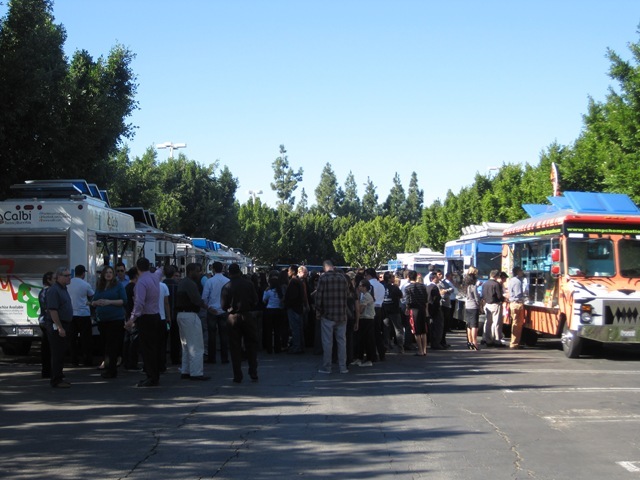 That is so cool about the Food Truck Day. Nashville has some really good taco truck, and I hear we now have a really good grilled cheese truck as well. Random, huh? Did I see that Korean BBQ truck on Diners, Drive-Ins, and Dives? If not, they had one with the same concept. I’d love to try it! Oh yum! To the pancakes AND to the cupcakes! 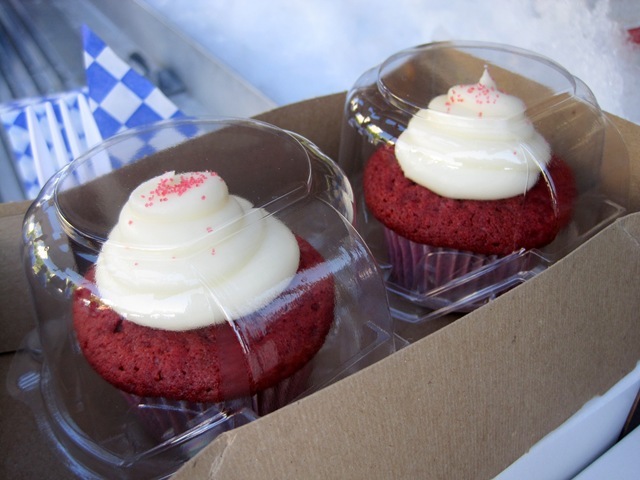 Sprinkles is my favorite… Red Velvet! 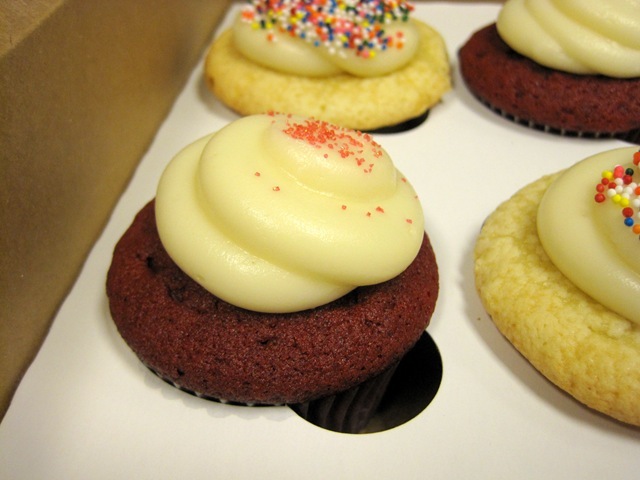 Same here, my favorite cupcakes at Sprinkle’s is the red velvet flavor. 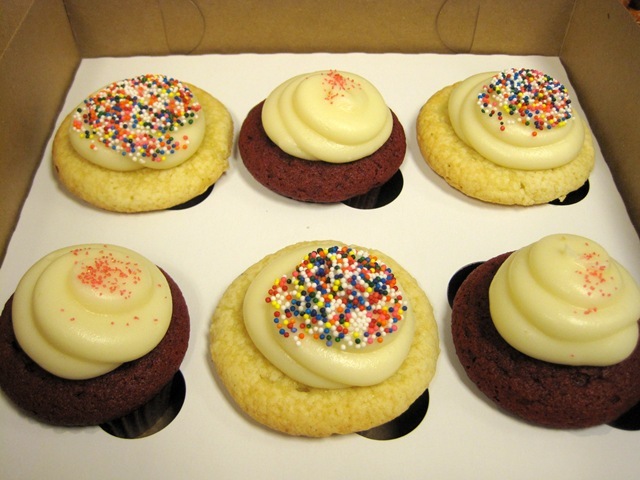 I love Sprinkle’s cupcakes but I have been told the cupcakes at Crumbs taste even better. I want to try it. Yup, just roll it, put it in a ziplock bag and ready to go. Ooh, love the sweet potato pancakes recipe! What a great idea! I’m definitely a morning person, too. I hate that thought of wasting the day ahead! and i LOVE these sweet tater pancakes!! brilliant! How pretty are you and your friend! Seriously, you guys are just gorgeous – no wonder you were on the OCWeekly website. Second to you guys are the cupcakes. 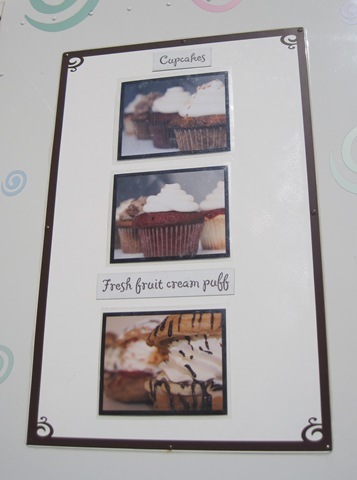 I suddenly want to indulge…but here I am in Minnesota, surrounded by snow – no cupcakes in sight! Hi Lea! It was great meeting you today 🙂 I love your blog! It’s so cute and informative 🙂 Those cupcakes look amazing!! Yay, glad you found my little corner in the blogosphere. I’m glad we met today and had a chance to chat and hangout. I’m always excited to meet other bloggers in the area. Thanks for stopping by. You must work pretty close to me. Two of my co-workers and I had planned to go to that but then they both decided to work from home last-minute, so I skipped it. Next time! I have turned into a morning person too! I agree that a good breakfast and getting things down first thing is a great reason to get out of bed! I love the truck day! 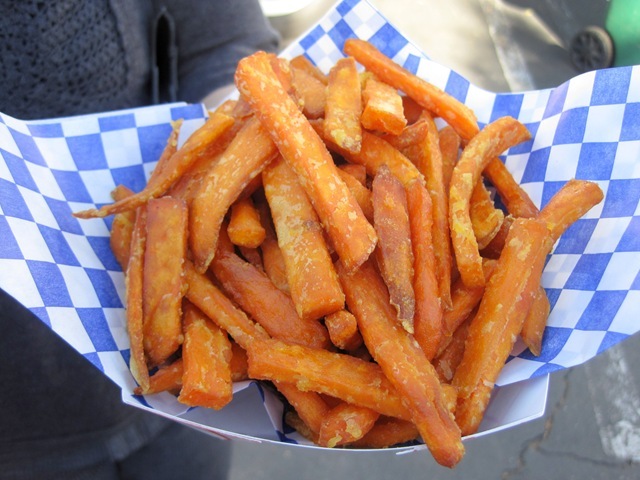 And the sweet potato fries….wow! Melissa, I totally agree. That’s one of the reasons why I love getting a head start to my day early. I feel like I get a lot of things done. Hey. These sweet potato pancakes look great. Would you ever eat them for dinner ha? are they filling? Thank you!! Also, what do you know about dessert hummus? Like making something sweet out of garbonzo beans? Any help would be awesome! If you like eating something sweet for dinner, I don’t see why not these pancakes would not work. I haven’t personally eat them for dinner, because I like them for breakfast, especially when I am in a hurry because I can roll them up and eat them on the go. 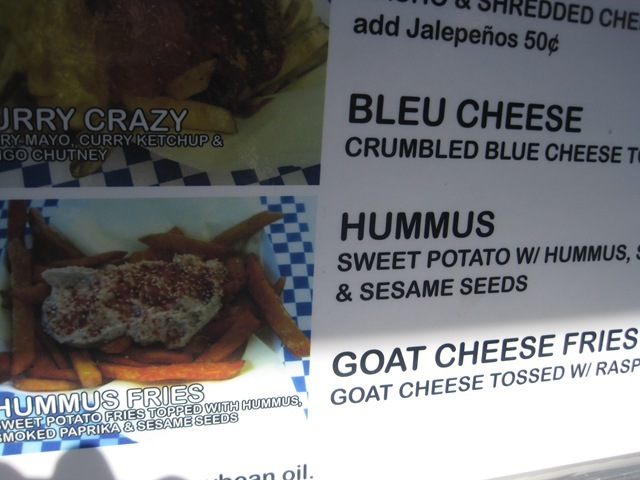 As for the sweet hummus, I’ve seen other bloggers make them but I have not tried them myself. Angela, at Oh She Glows should have sweet hummus recipes. These were delicious! I used cinnamon, all spice, and ginger and topped them with a little non-fat Greek yogurt and honey.